I too have that experience. The problem is, they tend to be sized for a 1280×960 projector screen, which is not really good enough for modern illustrations. A useful rule of thumb is that if you want to be able to print at 300 dpi across the active area of a sheet of A4 — (which is 8.27 inches minus 2-cm margins each side, for a usable width of 6.69 inches), you need horizontal resolution of at least 2007 pixels. But you really want to go much bigger than that, since online journals can provide much better resolution than even the best printed journals. Now, whenever I create an image for a talk or poster, I consider up front if I will one day want to publish it. If so, I make it at full-size, and only shrink the render. Not everything moves well between those forms. We learned from experience that translating the text of even quite formal blog-posts into prose for a paper is a serious piece of work. The good news is that illustrations are largely identical between all these forms: the hard work of preparing clean multiviews from photos need be done only once, and the later more formal versions need only the additions of scalebars and suchlike. The moral of this story is very simple: always prepare illustrations in the highest resolution you will ever need, and in full colour. You can reduce resolution later, or reduce to greyscale; but if you prepare at low resolution or in greyscale, you can’t increase resolution later or add colour. (*) He actually said “assloads”, but I censored it for this blog. Hey sports fans, as the year winds down I bring you another podcast appearance. 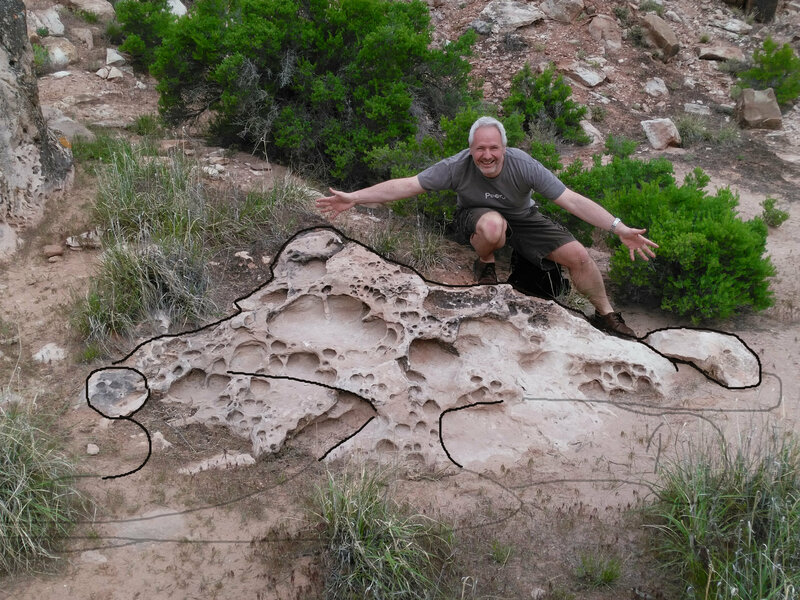 This time out I’m rolling with Mark Hallett, and we’re talking about sauropods through the lens of our still-plausibly-somewhat-newish book, The Sauropod Dinosaurs: Life in the Age of Giants, on the I Know Dino podcast. Many thanks to Sabrina and Garret for having us on the show. While you’re on that page, check out the nice preview of Mark’s 2018 dinosaur calendar, which is available at Pomegranate and Amazon. 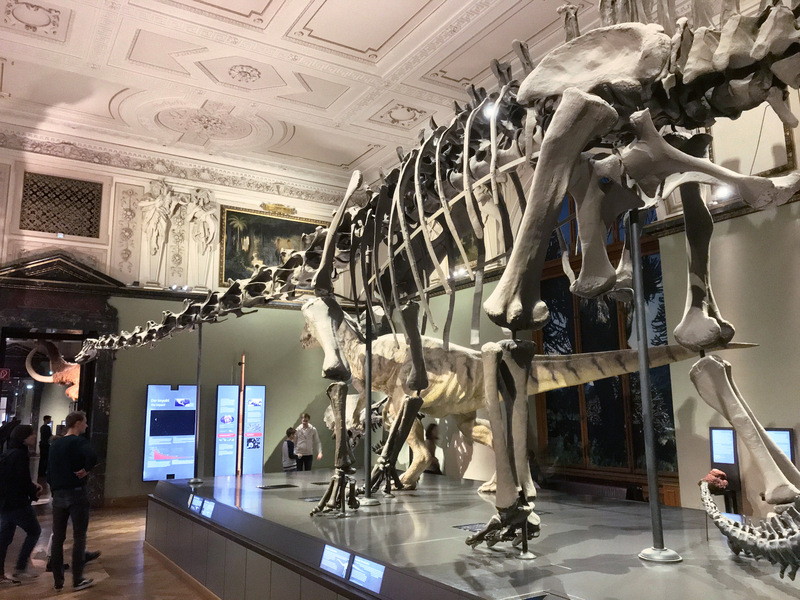 The photo shows the Diplodocus carnegii cast mounted in the natural history museum in Vienna, one of Andrew Carnegie’s gifts to the world. A happy seasonal metaphor, sez me. Hope your new year is equally happy! 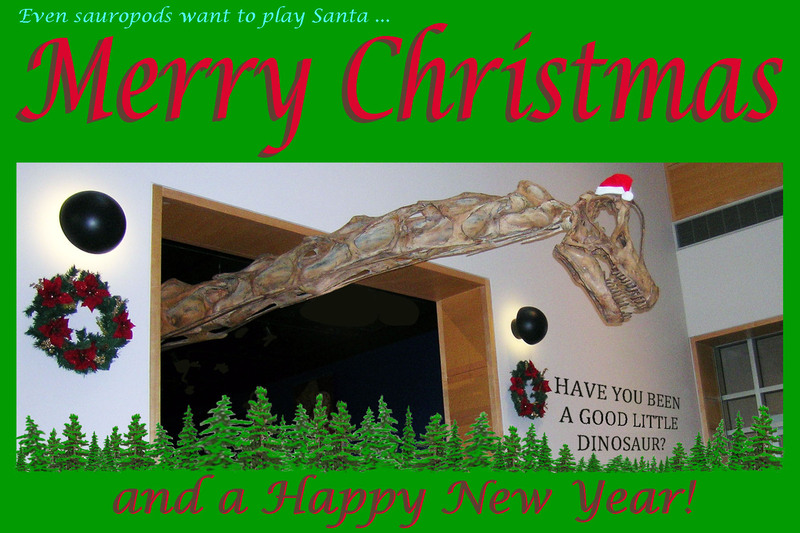 This year Santaposeidon comes to you courtesy of OMNH vert paleo head preparator and 20th-level fossil conservation wizard Kyle Davies, who took the photo, composed the card, and gave me kind permission to share it here. Needless to say, we’re happy to pass on the happy holiday wishes to all of you, wherever you are and whenever you are reading this. I have used this photo in loads of talks, but as far as I can tell, this is the first time I’ve put it up on SV-POW! (I am certain that, having said that, someone will find a previous instance – if so, consider this an extremely inefficient and lazy form of search.) 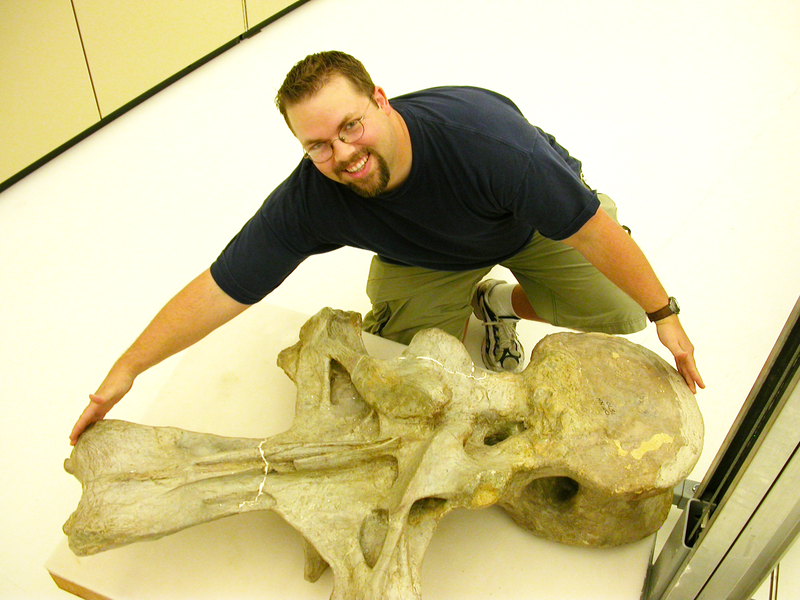 The vert is OMNH 1670, the most complete and nicest dorsal of the giant Oklahoma apatosaurine, probably a D5 or D6. That’s me back in 2004. Photo by my then fellow grad student in the Padian lab, Andrew Lee. I’m 6’2″ and have normally-proportioned human arms, but if you’re trying to figure out the scale, that vert is 135cm tall, with an anterior centrum face 38cm tall by 46cm wide (partly reconstructed but probably accurate). See this post for more details and a fairly exhaustive list of measurements. 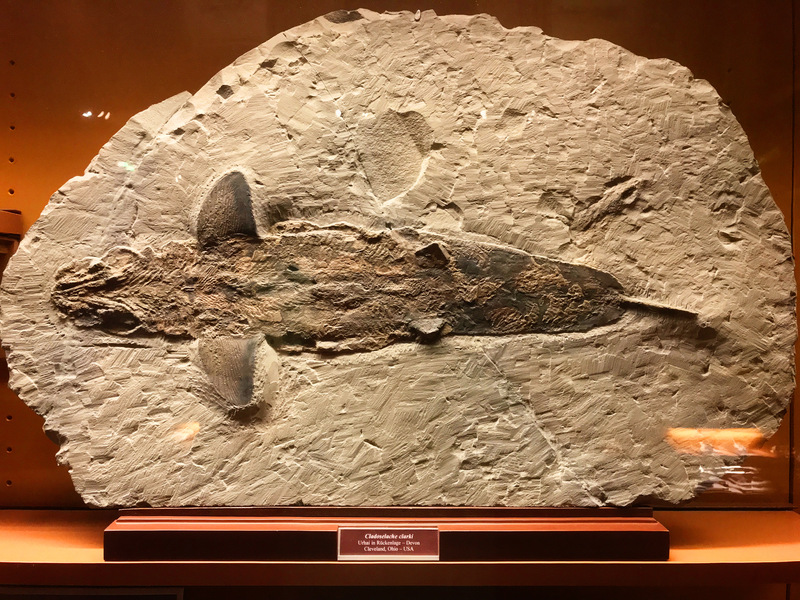 Case in point – this bitchin’ shark, prepped in ventral view, which I saw last month in the natural history museum in Vienna. Look at that fat, muscular tail – this shark is swole. That’s dumb. And this blog is in danger of slipping into senescence, and irrelevance. So here’s my New Year blog resolution for 2018: I’m getting us back to our roots. I, or we – I am taking this plunge without consulting with Mike (surprise, buddy!) – will post a new, never-posted-before photo, at least once a week, for the whole year. 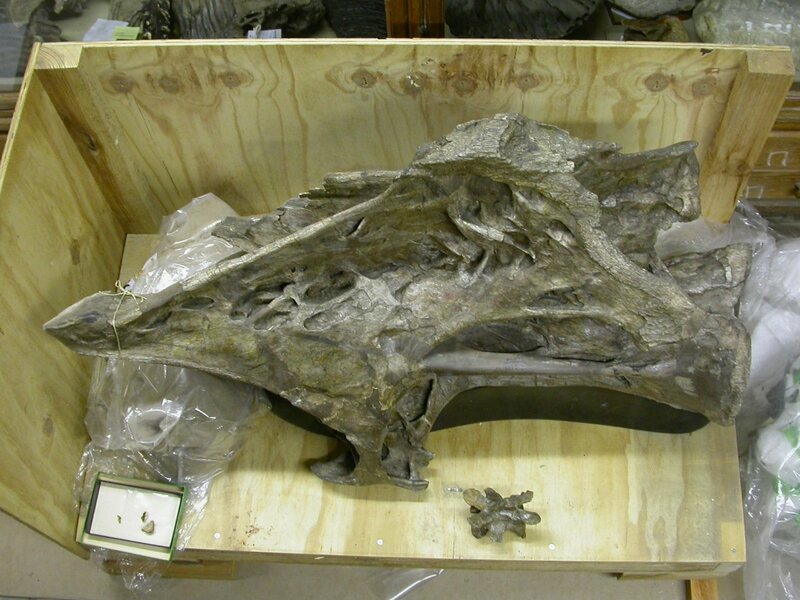 It may not always be a sauropod vertebra, but if often will be, because that’s what I have the most of, and the most to yap about. And I will try to write something interesting about each photo, without lapsing into the logorrhea that has too often made this blog too exhausting to contemplate (at least from this side of the keyboard).